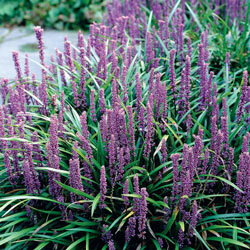 This lovely perennial gracefully fills spots where nothing else will grow. Its large, lavender flower spikes resemble grape hyacinths above the arching, evergreen tufts of grassy foliage. Excellent for planting under trees or overhangs, or in other shady areas. Easy-to-grow, deer-resistant and drought-tolerant, this perennial is ideal for erosion control or as a ground cover in a variety of garden situations.